RECOMMENDED USE : Take 2 tablets 30-60 minutes prior to workout on an empty stomach. CAUTION: If you are pregnant, nursing, have or had kidney disease, or are currently taking any medication, consult with a healthcare professional prior to use. Keep out of reach of children. Store in a cool dry place below 30°C. Arginine is an alpha amino acid, which is defined as conditionally indispensable to human body, and in other cases it is essential - under specified conditions of the individual(trauma, burns, inflammation, etc.). Normally the human body maintains an adequate supply of L-arginine on its own, but heavy exercises require it's further acquisition through diet or supplementation. Arginine plays an important role in cell division, immune defense, wound healing, removal of toxic ammonia from the body and in the control of the endocrine glands. 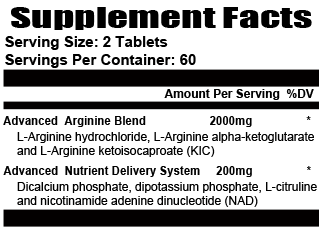 Arginine is the direct precursor of nitric oxide, urea, creatine, polyamines and citrulline. L-Arginine assist healthy platelet function and enhanced exercise tolerance. Additional trials indicate that L-Arginine may support healthy lipid metabolism enhancing its cardiovascular support properties. Arginine has demonstrated immune-supporting activity and may promote the utilization of nitric acid by scavenger cells for defense mechanisms. L-arginine is converted in the body into a chemical called nitric oxide. Nitric oxide causes blood vessels to open wider for improved blood flow, also stimulates the release of growth hormone, insulin, and increases blood flow to the sexual organs improving sexual function. L-Arginine is required in muscle metabolism and helping with weight control since it facilitates the increase of muscle mass, while reducing body fat.